A lot of people reach out to me because they are tired of struggling with their kids’ behaviors and they don’t know what to do. Many are just looking for a list of things they can do to stop yelling at their kids, and while I can easily rattle off a bunch of things they can do to start increasing the peace in their home TODAY, here’s the truth: If you want results that last longer than just a few days, then you have to do some digging and take a look at your emotional triggers. Then it’s time for you dig deep and learn how to identify your emotional triggers so that you can find more positive ways to respond when they arise! Emotional triggers are just things that happen….something someone says or does…that trigger specific emotions within you. Maybe you get really upset every time someones lies to you, or maybe whenever someone talks about their mom you get really sad. We all have triggers and whether we like it or not, we’re not going to wake up one day and magically STOP being triggered. It’s not like you can just snap your fingers and then all of a sudden you’ll never be triggered again. If that was the case, then moms all around the world would be snapping away and WAY less stressed! Here’s the thing, no matter how badly you want to be a happy, loving mom…every day you are faced with behaviors that seem to “take you there” because you are getting triggered. Your emotional triggers, whether you realize it or not, come from personal experiences (how your parents disciplined you, being bullied at school, workplace traumas, etc.) and when they pop up, they often cause you to react in a negative way NOT based on the current situation, but based on your past experiences. If my son would just stop whining, then I wouldn’t yell so much. But you’re not really reacting to his whining – you’re reacting to the meaning you’ve placed on that behavior based on your previous experiences. Maybe you were punished for whining as a kid and now you view whining as annoying or disrespectful. Maybe your younger sister always got what she wanted by whining and now you view that behavior as manipulative. Here’s the thing. We ALL have triggers. And once we get triggered, we lose the ability to be the positive and purposeful parents that we want to be because we go from responding (with love and respect) to reacting (with anger and hostility). In order to truly begin to make changes in the way you respond to your chid’s behaviors, you have to start by identifying your emotional triggers so that you can begin to heal from them. Not sure where to start? Those are your emotional triggers! Whether it’s feeling lonely or disrespected, powerless or like the bad guy…those feelings that made you explode and yell at your child, or spank them and send them to their room…..those triggers are things that you need to heal so that you can begin responding to your CHILD instead of to your PAST. I know, I know….it sounds easy now, but putting it into practice is a whole different story, right? Not allowing your triggers to control how you respond when your child does something you don’t like is a process….and for many of us it’s a very long and hard one. 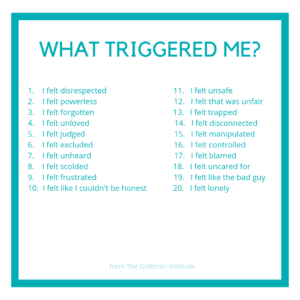 If you notice that you’re constantly getting upset by your child’s behavior, I challenge you to try and identify what is triggering you, and then trace that trigger back to your childhood. For many of us, this requires outside help (because we’ve been living with the triggers for so long it’s hard to pick them out) but it’s sooooo worth it! Identifying your emotional triggers is the first step in healing from them…and once you heal you are one step closer to being able to respond to your kids’ unwanted behaviors in a positive, loving, respectful way! So, let’s start the journey now! What’s one behavior that often triggers a negative response in you? Can you think back to your childhood and identify where your feelings stem from? Who can you reach out to for help with healing this trigger? After all, if you’re serious about having a more peaceful home then that change has to being with you…and I am here to help! We got this, mama! Let’s heal together!